Living on an island and working from home can get pretty lonely. 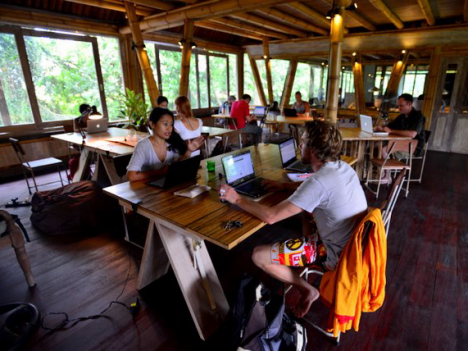 Coworking is a great alternative! Jeff and I have been enjoying the natural benefits of Maui for years. We started and continue operating our successful online tech company in Maui. However, our business is global. It doesn’t rely on the local economy. This creates a huge lack of interaction between us and other local business owners. In short — it’s lonely. We believe there are more like us on the island — talented business owners, contractors and freelancers working in isolation. Maui is a small community that breeds entrepreneurs seeking to comfortably afford and enjoy the benefits of life in paradise. This isolated environment requires ingenuity, hard work and bootstrapping to survive. Maui doesn’t leave much room for failure. There is a high turnover rate. If you don’t succeed, you get ejected back to the mainland. Maui provides the ability to balance work and play like nowhere else. Our space will make it possible to go from a productive work environment to sipping a Mai Tai, catching a wave, or diving with sea turtles in a matter of minutes. The atmosphere will be fun and laid back, but the goal will be to create successful businesses and spark collaborative interaction. The dream is for Maui to be recognized as a tropical oasis for the tech community. A place that attracts talented entrepreneurs for more than the natural beauty of the island, but as a place for them to both work and play. Like most startups in the islands, our space will have humble beginnings — probably not much more than some desks, lightning fast WiFi, a foosball table and fridge stocked with Maui Brewing Company to start. Our immediate focus is finding a killer location, and then growing the space and amenities as we gain momentum. It doesn’t matter if you’re a resident of Maui or Minnesota. If you’re interested in relocating, visiting, planning a retreat or hosting a workshop on the island — we want to know what you think about a space where like-minded people can meet and create amazing things together in paradise. If you have interest in becoming a member or occasionally dropping by the space — please kokua and let us know. To follow the progress of this project, follow @ErikBlair on Twitter. Update: Coworking on Maui is currently being provided by CoHana at the Maui Research & Technology Center in Kihei. How is this project progressing? I’m on Maui (since mid-July) and interested in plugging into a coworking community. I was on the fringes of the group that launched IndieDesk [http://www.indiedesk.com/] in downtown L.A. a few years ago, and would be interested in helping a similar concept get off the ground here. Please get in touch if this is still a live project! Strike while the anvil is hot!! Let’s do this! Be interested to see what you guys are doing…. Hello, I am interested as well to see if this is moving forward. I am looking for business opportunities in Maui or as a customer! Aloha Mark! It’s going to be a pop-up, event based co-working space to start. The website is http://sproutoffice.com, and it should be live soon. There’s also a space in Kahului opening up called mbloom, http://www.mbloom.com/. Great idea! We need this on Maui. I’m creating a tech start-up with a partner and we are certainly in need of a coworking and meeting space of this kind. When are you guys planning to open your doors? Hoping this is coming up soon! Very interested in it. Thanks! Any progress on this? Looking for a shared workspace myself. Did this ever come to fruition? I’m very interested to help make this happen if it hasn’t yet. If it has, I’d like to find out more about it…. Is this co-working space up and running? Hi There. I’m back in Maui for a month and looking for coworking space. I’m headed to Kihei to check that out. Love to say hello to those that use the space or know of other locations as its a bit of a hike from Haiku, where I’ll be staying. Looking forward to meeting you! Aloha! It is really a very great concept for freelancers or entrepreneurs. I like it and what a great idea!